Yes, the creek adjacent to the Macaulay Salmon Hatchery is really called Salmon Creek. Millions of silvery coho (silver) and chum (dog) salmon are expected to return to Juneau area creeks, streams and rivers over the next few weeks. Chinook (king) and pink salmon arrived about three weeks ago with sockeye (red) salmon arriving in the next couple weeks. It is an extraordinary chapter in the salmon life-cycle and just as extraordinary to witness millions of salmon making their way back to the waters where they themselves were born. 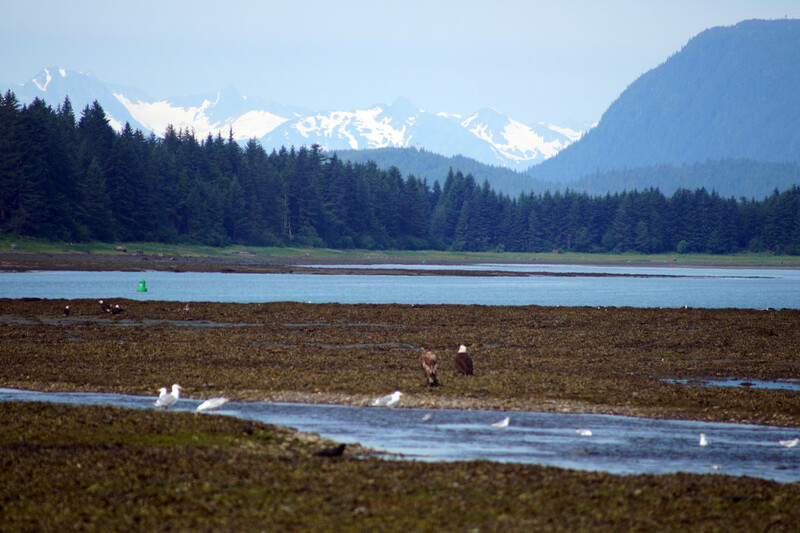 Eagles, sea gulls and artic terns wait for low tide to reveal salmon and their eggs. Hordes of fisherman, eagles, seagulls, ravens, crows, arctic terns and sea lions are congregating at the mouth of Salmon Creek and at the hatchery’s fish ladder entrance to partake in this annual sushi buffet. Black bears will also be plundering the upper reaches of area’s waterway’s during the twilight hours of dawn and dusk. I often see black bears fishing for sockeye salmon at the Steep Creek bear viewing platform at the Mendenhall Glacier Recreation Area. Hatchery fish now make up more than half of the total commercial chum salmon harvest in Southeast Alaska. — Alaska Department of Fish and Game. The salmon migrate to the hatchery because they are genetically inclined to return to their natal waters. Some go astray and spawn in Salmon Creek or other waterways, but that is good as it adds genetic diversity to the local salmon population. To learn more about salmon, go to http://www.adfg.alaska.gov/index.cfm?adfg=sockeyesalmon.main. To learn more about the Alaska Fish and Game hatchery program click on this link. the more than 130 plants and animals that utilize nutrients from salmon. 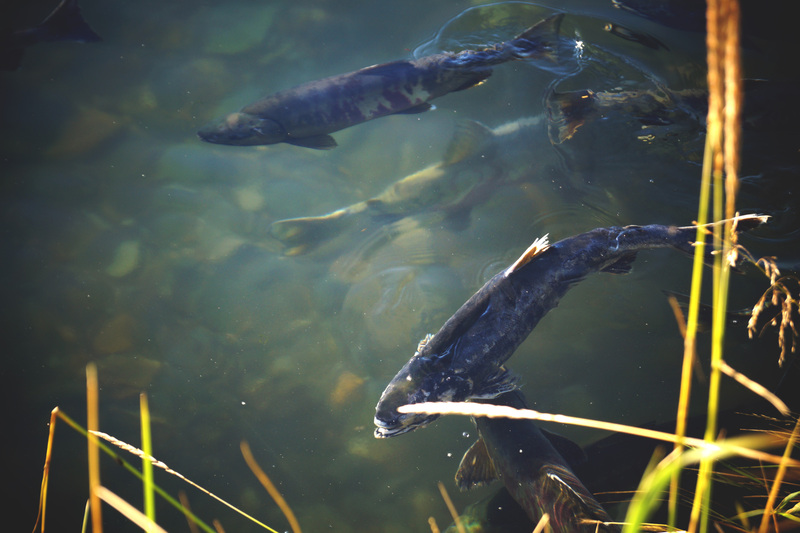 The Alaska Salmon Hatchery program was established to increase fish abundance, enhance fisheries, serve the residents of Alaska and protect wild salmon stocks. 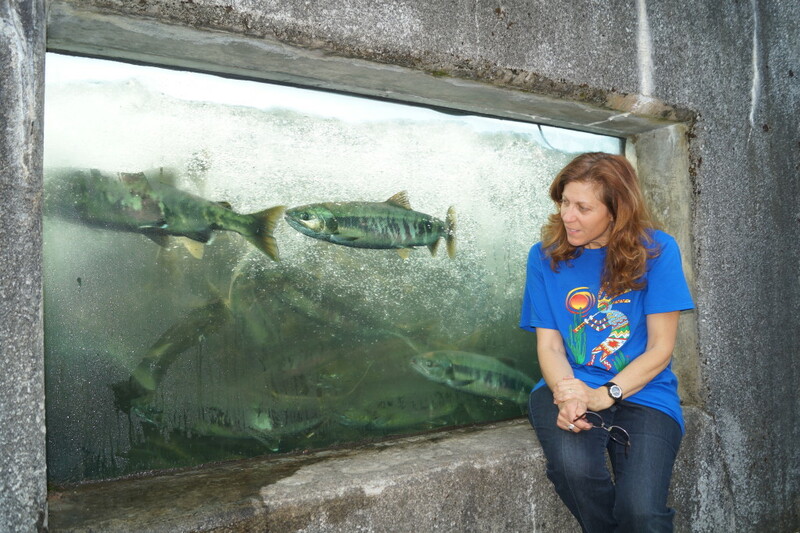 Viewing windows make it easy to watch the salmon as they make their way up the fish ladder. Macaulay Salmon Hatchery is open to the public during the summer and is one of the most affordable and fascinating tours in Juneau. I rate it among my top-10 things to do in Juneau if you visit when the salmon are swimming up the fish ladder. For only $3.25 for adults and $1.25 for children, visitors can take the basic tour to learn about the fascinating life cycle of salmon, their near shore marine environment, and the inner workings of a hatchery. There is also the summer-only (June-August) Deluxe Nooks & Crannies Tour (adults $10, children $5.25) where visitors get an inside look at the hatchery’s operations, including a behind-the-scenes tour and extended commentary. Most cruise ship offer this excursion, but if you purchase this tour through your cruise line, it will cost more because the cruise lines provide transportation to and from the hatchery and often combine the hatchery visit with another local attraction. 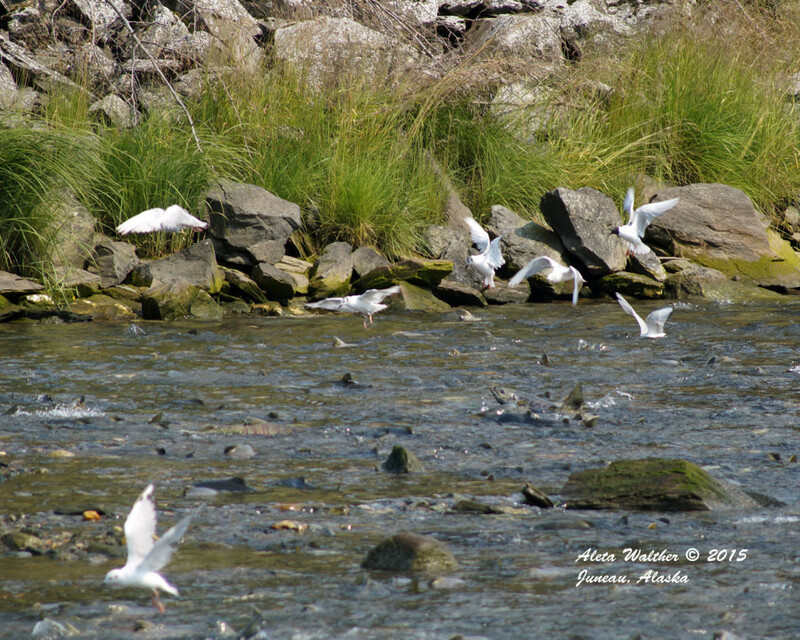 Salmon eggs are a favored feast for the Bonaparte’s Gull.